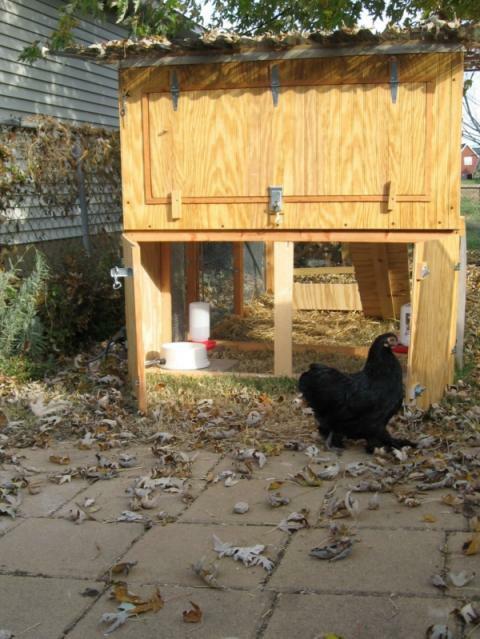 Our third coop is a "mini coop" designed for quarantine, raising chicks, and any other needs that have since sprung up. It was originally designed to be broken down and moved by one or two people. It is made of pine bead board, with a layer of foil-backed foam insulation on all sides and interior walls of thin boatbuilders' veneer. The floors are vinyl. The top "box" is 4' wide by 2' high, 30" deep and features footlocker handles at each end so you can pick it up. It was screwed onto the bottom section, which simply has a vinyl-lined wood floor and acts as a feeding area. Access doors are on both top and bottom levels. There is one nest box inside the coop, and a low perch for sleeping. The front of the coop has a pop door and large vent, and there are small circular vents all along the ceiling. Heat in winter comes from a combination of heat tiles on the floor and walls, and a coil of reptile heat cord fastened along the coop ceiling interior with electrical tape. We built the small 4 x 8 pen in sections, again for ease of moving. They are connected by lag bolts. The polycarbonate roof was added later, and does substantially increase the time it would take to move the coop around. . . but it sure is nice keeping the pen dry! 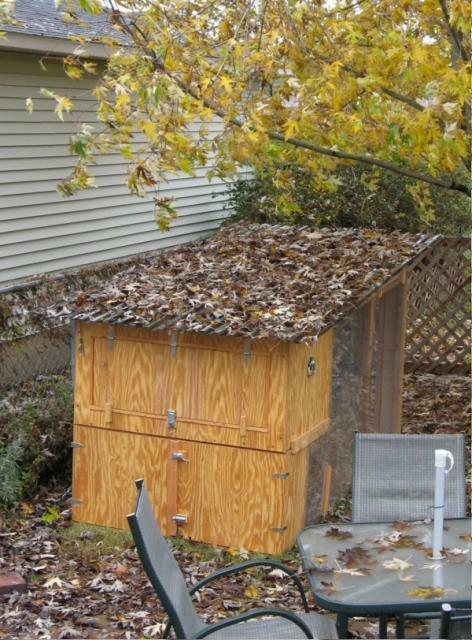 A coop this size is great for up to two standard (large fowl) hens, four bantams, or a group of chicks. It could also be used to house a broody with eggs/chicks. Nice looking tiny coop. Be good to have some pictures of 'how to' as you were going along. "Love this for bantams or brooder"
Great build for a broody hen, a grow out pin or just a couple bantams. Would like to see how you set up the inside.